How far will the kindest human being have to go if he is trapped in harsh conditions, where only his other part, the more brutal and uncontrollable part, can save his life? Unfortunately, the most popular answer to this question would be – anything. But what if in that brutal and inhuman condition is a dog, a mixed-breed dog, from the streets? Can we blame the animal for crossing a line, when only we, as human beings are responsible for what he has become? There is no easy answer to this question – and you, as the viewer must find your own answers… But do not rush to find them, because this film has something more to offer you – it will open your eyes, to look at certain things from a different perspective… and maybe in the end, you will have only one question: – Why? Lili (Zsófia Psotta), a thirteen-year old girl, is forced to abandon her dog, Hagen right on the streets. Feeling bad and worried for her four-legged friend, Lili goes back to the street to find her dog. But by the time she gets there, it is way too late… because she no longer recognizes Hagen, the dog she loved so much; the dog for whom she had an argument with her dad and the music teacher defending him. Her strong love and confidence in her beloved dog, and despite her father`s orders, a young, fearless girl goes to face an extremely dangerous Hagen, who may no longer remembers her. 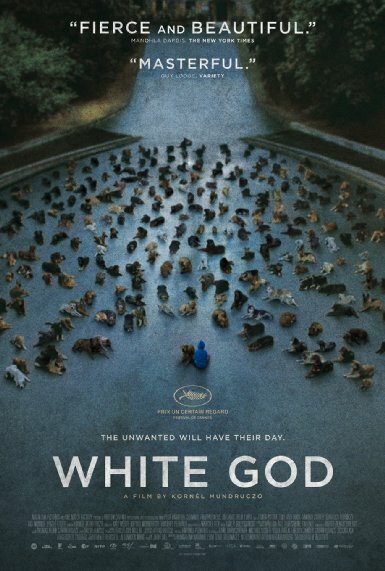 There is no reason not to like Kornél Mundruczó film, White God (Fehér isten, Original title). It is simply stunning, breathtaking, and shows how cruel humans can be. It`s quite unbelievable to think how the entire crew filmed the scenes where only dogs were involved. There are many masterfully done scenes, with great cinematography, and to see the dogs and their emotions transform from good to evil is fascinating and deserves our applause. But what most interested me in this film, is its subject matter. For instance, when the film begins, we find Dániel (Sándor Zsótér) cutting up a cow to see whether the cow is good for consumption, or not. Then, Dániel meets with his ex-wife, who leaves their daughter with him for three months. Knowing the job Dániel does, we can hardly believe that he will ever accept Hagen. And, the scene where Lili leaves her dog on the street, is very touching. We see a clear connection between a dog and a girl, who both have no desire to be apart from each other. When Hagen is sold by a homeless man to a dog-fight organization, we see the most heartbreaking part of the film, full of realism and the cruelty that human beings can bring. Hagen, who used to be a kind, loving, and faithful friend of man, is transformed into a dog-killing machine, who must fight with his own kind. And, the saddest part of the story is, it`s a human who tries to make a pet act like a real and deadly, dangerous animal. Mundruczó does extraordinary work with his film, creating something unique, raw, and unlike many other films, which will certainly stand out. White God is about everything – it`s about kindness, humanity, love, friendship and loyalty. And it is also about how far human beings will go in order to achieve their selfish and cruel plans. Still, it can`t change the simple fact that once a loving heart loves, it will always love, even if that heart is in the body of animal, not a human being. Saying that, isn’t this everything we want to see? Something that can speak more than words, through a film, like White God? Wow! You’ve really sold this one to me. I’ll make a point of seeing it. Thanks for another great review. Can’t wait. You’re welcome too, Keep up the fine work. Really looking forward to this movie. Nice reviews, as always.